All prices include: accommodation, guided activities and meals; all as listed. 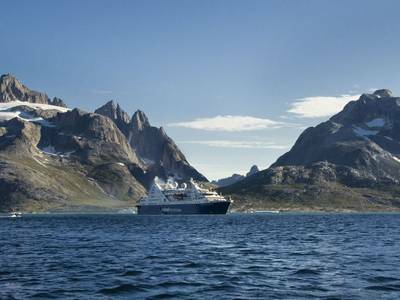 This eleven-day cruise is a unique way to experience the stunning scenery and natural wonders of Greenland and Iceland. Your mode of transport will not only allow you to make the most of all that the Arctic summer has to offer but it will also allow you to travel in comfort as the MS Ocean Diamond is equipped with many modern facilities to help you to feel at home. As well as the opportunity to witness natural marvels such as fjords, glaciers and icebergs, you are also in with the chance of spotting some beautiful wildlife. Whales, walruses and seals have all been spotted on this route! The new cruise itinerary around Iceland and Greenland gives you an excellent opportunity to experience both countries and their stunning nature and scenery from a very different perspective. The all-Icelandic expedition crew are not only informative and entertaining but will take you around Iceland and even into Greenland on several exciting shore excursions. Discover the immense variety of the world’s biggest island and the beauty of the ‘land of the fire and ice’ during this thirteen-night tour of Greenland and Iceland. Enjoy the awe-inspiring south with its fascinating Viking history, see Ilulissat, the town of icebergs and a UNESCO World Heritage site before finishing in Reykjavik, the coastal capital of Iceland. A note on flights: flights to and from Iceland are not included in the holiday price so that the best available fares and most appropriate schedules can be found for you at the time of booking. This route is served by both low cost and scheduled airlines and our Travel Experts will happily provide you with a quote and arrange flights on your behalf. During this unforgettable thirteen night holiday, you will enjoy the long days of the Arctic summer whilst also making the most of the captivating and wild beauty of Greenland and the magnificent natural wonders of Iceland. You will also have time to explore Reykjavik, one of the smallest capitals in the world. Boarding the boat in Greenland, you will explore the rugged and remote west coast, a region that reflects and promotes the traditional way of life which is widely embraced on the island. The landscape throughout is dominated by steep fjords, floating icebergs and immense glaciers and there is some staggering scenery to enjoy. In Iceland, you will visit the Westman Islands and witness the power of the natural world as you see the destruction and beauty which has been caused by volcanic eruptions over thousands of years. Throughout this arctic cruise, you can add in shore excursions to further explore or simply enjoy the views and the presentations from the expedition team on board. 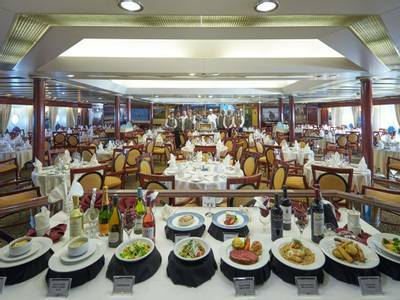 The MS Ocean Diamond is a delightful cruise ship; large enough to offer guests great facilities and comfort but, with a maximum of 224 passengers, the vessel is small enough to ensure the best possible experiences for all on board. The expert team on board will make your stay as comfortable as possible and your meals are included from the night you board until the morning you disembark; so you really can relax and focus on your holiday. This is an unforgettable arctic adventure which takes in two wild countries and a vast number of natural wonders. Having touched down at Keflavik Airport, you will be greeted and transferred to your hotel in Reykjavik. Depending on your arrival time, you can either relax in your hotel room or stroll around the city. Today, you can explore this fascinating city before your flight to Greenland this evening. There is a lot to see and our Travel Experts will be happy to suggest some suitable itineraries for you. Your flight from Iceland will land around 8 pm in the remote town of Kangerlussuaq and as you descend towards the airport you may begin to understand the sheer scale of the wilderness here. The MS Ocean Diamond will be awaiting your arrival, anchored off the coast of Kangerlussuaq, and you will embark via Zodiac boats ahead of your departure. 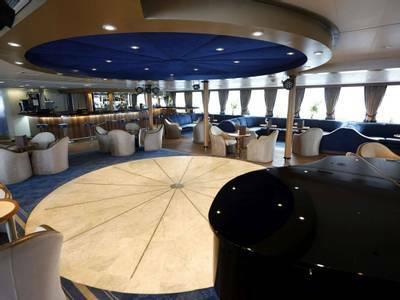 You can check into your cabin and get acquainted with the facilities on board before a welcome drink and dinner. 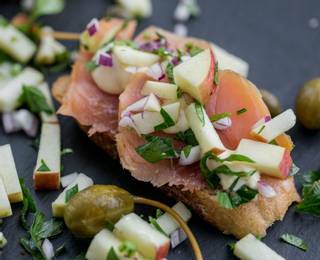 You can really relax, knowing that all of your meals are catered for from here on and that the expert team on board is there to ensure you have the most wonderful experience. Today you will visit Sisimiut, the second largest town in Greenland with approximately 5,600 inhabitants. As you walk around, you’ll see a modern settlement with ancient traditions still playing a role here. Known as an adventure travel hub, it’s easy to see why with the surrounding mountains providing grounds for exploration. You’ll also learn all about the country and the people during a presentation provided by knowledgeable guides. In the morning you will see the beautiful Eqip Glacier. The Eqip Glacier is an awe-inspiring sight to see and the face of the ice stretches for around five kilometres. It calves into the sea on a fairly regular basis and the sound and sight of these vast chunks of ancient ice crashing into the water is remarkable. There is no colour quite like that of the blue of glacial ice. Your next stop is Ilulissat, which means ‘iceberg’ in Greenlandic and the reasoning behind its naming will become wholly clear upon arrival. The Ilulissat Ice Fjord is filled with vast icebergs which have been formed by gigantic sections of glacial ice breaking off into the surrounding seas. The sight of these icebergs is sure to be breathtaking and you will certainly understand why it has been designated as a UNESCO World Heritage site. The Sermeq Kujalleq Glacier is one of the most productive glaciers in the Northern Hemisphere and calves over 13 square miles of ice per year. With luck, you may get to witness such an event during your stay. Today sees you hit the most northerly point on your travels as you visit Uummannaq which is situated around 300 miles north of the Arctic Circle. This is one of the most picturesque villages in Greenland, residing at the foot of a heart-shaped mountain and home to around 1500 residents. The multi-coloured homes are dotted around a rocky coast and look out across the vast Ocean. It is fascinating to see how people live and thrive in such an utterly remote location. 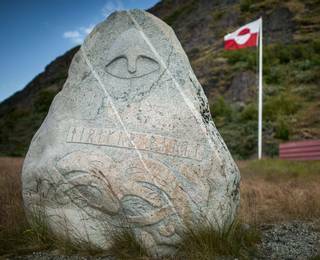 A visit to the Uummannaq Museum, which tells brilliant stories from the region, is included. Very interesting is an exhibition of Alfred Wegener’s expedition on a propeller-driven sled. Qeqertarsuaq is a small settlement located on the south coast of Disko Island. Founded in 1773, there are many stunning natural features here and also the Arctic Station, the oldest continuously manned station in the Arctic. Upon arrival, you can’t help but notice the flat-top mountains that are locally known as the Grand Canyon. As you make your way in and out, keep an eye on the water for the different whale species found here. The city of Nuuk is the capital of Greenland and visitors can witness the charming combination of long-held Arctic traditions and modern life in a bustling town. Dating back to 1728, the city is the oldest on the island and was founded in 1728 by a Danish-Norwegian missionary. 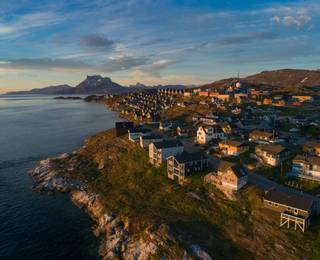 Nuuk is a relative metropolis with around 16,000 residents and your time here can be spent enjoying the culture and heritage of the town. Today, you will visit the breathtaking Ikka Fjord, and admire this unique land formation. Below the azure water, a forest of remarkable mineral columns grows on the seabed. These rare Ikait columns were formed over 10,000 years ago make for a distinctive and remarkable sight. 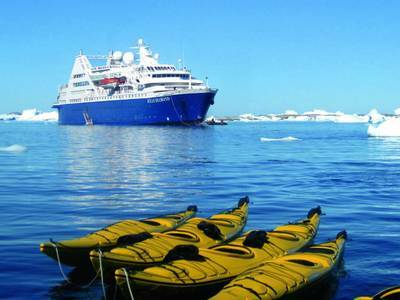 You will also have the chance to visit both Quassiarsuk and Narsarsuaq during the shore excursions. Quassiarsuk was founded by famed Viking rebel Erik the Red. Erik gave this country the name 'Green-Land' due to the surrounding landscape of mossy fjords and fertile green valleys. 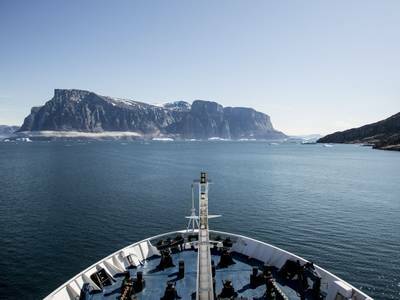 If conditions are suitable, today you will enter the ethereally beautiful, 70 miles long, Prince Christian Sound which connects the Labrador and Irminger Seas. Prince Christian Sound is filled with remarkable scenery – steep mountains often more than 1200m high border the narrow, often ice-choked channel and you will come so close to floating icebergs that you can almost reach out and touch them. The floating ice is caused by Greenland's massive inland icecap (the second largest in the world) which pushes the glaciers towards the sea where large chunks break off and become the icebergs that you witness here. Today you cross the Denmark Strait as you set sail for Iceland, following a maritime route that was first used by Norse settlers over 900 years ago. While you are cruising you can relax and enjoy the beauty of the open sea, keeping watch for whales, dolphins, and seabirds from the deck or from your cabin. Located off the South Coast of Iceland, the island group Vestmannaeyjar was formed by submarine volcanic eruptions around 10,000 years ago. Surtsey Island is the youngest on the planet and emerged in only 1963 to form part of this island chain. You will head ashore on Heimaey, which is the only inhabited island. The island offers a real sense of the power of nature and its fury as you witness the half-buried homes which have been coated in volcanic ash from an eruption in 1973. On the small Zodiac boats, you will navigate around this fascinating place, exploring caves and looking out for the abundant wildlife and birdlife which is on offer. In the morning, your journey ends as you dock in Reykjavik at approximately 9 am. Breakfast will be enjoyed on board prior to disembarkation. Whilst this is the end of your cruise, you will still have the rest of the day to explore Reykjavik. 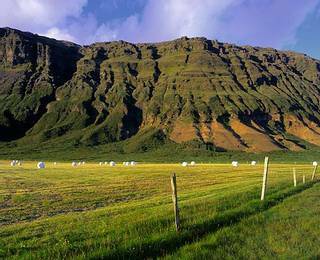 We can arrange an array of land-based experiences in order for you to make the most of your time here in Iceland. After breakfast, it is time to say goodbye to Iceland. You will be transferred to the airport for your journey home. 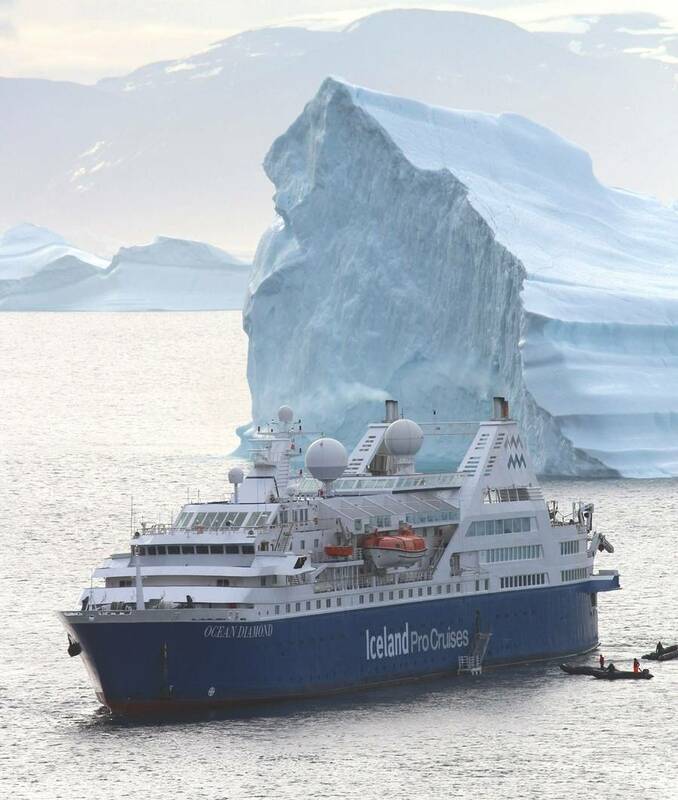 MS Ocean Diamond is a wonderful and modern vessel that has been specially equipped for Arctic voyages with ice-strengthened hull and stabilisers that help to reduce roll. 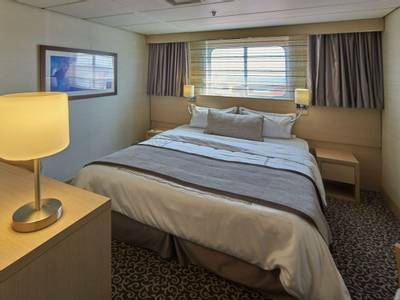 She is an ideal expedition vessel but that does not mean that there is any need to compromise on comfort as the facilities on board are excellent. The experienced and expert crew works with the expedition team to ensure that guests have the best possible experience whilst on board. She is compact and carries a maximum of 224 passengers, meaning that she can explore further than larger ships. This means that her passengers can take in highlights which may elude larger vessels. 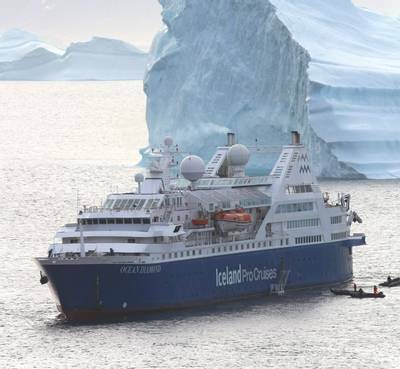 Her average cruising speed is around 15.5 knots and she is the first ever polar passenger ship to be carbon neutral, with all emissions offset. 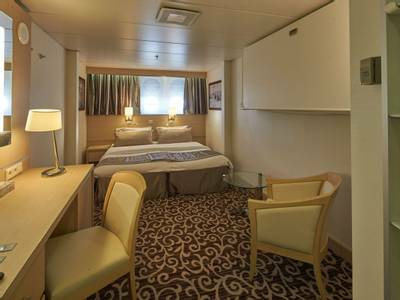 The ship has some fantastic facilities that make it both welcoming and comfortable. There are many types of cabin to choose from during your stay. Our holidays are based on Category P but we can arrange for guests to upgrade or downgrade to any of the other options subject to availability. Simply contact our Travel Experts for a quotation. Cabin Type P - Outside Cabin with porthole: These cabins are 19m² and contain double/twin beds, en-suite shower room, TV with DVD, safe, wardrobe, refrigerator, individual temperature control, satellite telephone access, hairdryer and two portholes. Please note that some views can be restricted by lifeboats, etc on deck. Cabin Type O – Outside cabin with obstructed view: These cabins are 19m² and contain double/twin beds, en-suite shower room, TV with DVD, safe, wardrobe, refrigerator, individual temperature control, satellite telephone access, hairdryer and picture window. Please note that the view will be restricted by lifeboats or similar. Cabin Type D – Outside cabin with picture window: These cabins are between 17-19m² and contain double/twin beds, en-suite shower room, TV with DVD, safe, wardrobe, refrigerator, individual temperature control, satellite telephone access, hairdryer and picture window. Cabin Type A - Balcony suite: These cabins are 30m² and contain a double bed, en-suite bathroom with bath and shower, sitting area, TV with DVD, wardrobe, safe, refrigerator, individual temperature control, satellite telephone access, hairdryer, full-size window with sliding glass door and a balcony. Cabin Type B – Suite: The suites are spacious at 37m² and feature either two twins or a double bed as well as an additional two twin beds, two private bathrooms with shower or bathtub, sitting area, TV with DVD-player, wardrobe, safe, refrigerator, individual temperature controls, satellite telephone access, hairdryer and picture window. 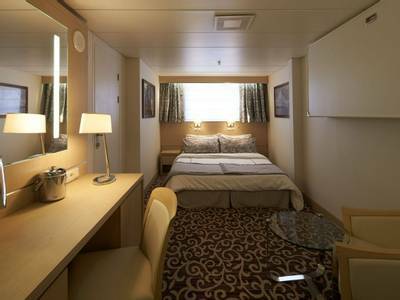 Cabin Type T – Triple cabin with porthole: These cabins are 19m² and contain two twin beds and one upper bed. They are en-suite with shower room, TV with DVD, safe, wardrobe, refrigerator, individual temperature control, satellite telephone access, hairdryer and two portholes. Please note that the view may be obstructed. On this tour you will learn about life 200 miles above the Arctic Circle. 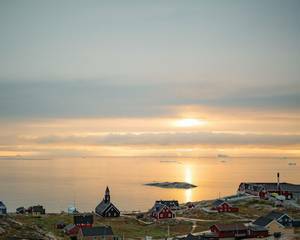 Ilulissat was an important Danish trading post in the past and this tour will take you to the harbour, the 18th-century Zion Church and the city museum (entrance to the museum is included). Ability to walk on uneven terrain is required. Small sturdy local boats will take you to the mouth of the Ilulissat Ice Fjord, where an underwater moraine catches many of the big icebergs. 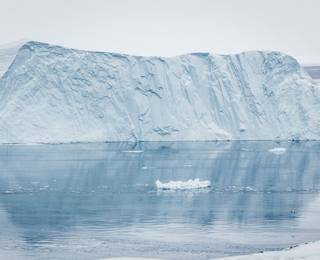 The only way to get over the moraine is pressure from behind – therefore you always find a multitude of huge icebergs just in front of Ilulissat. 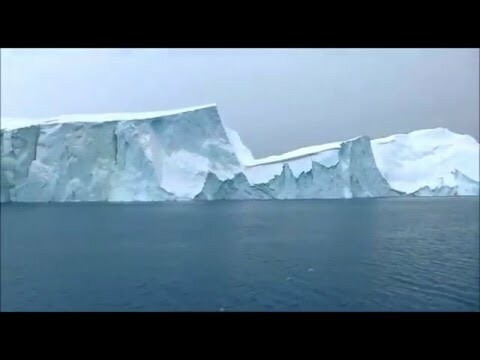 As the boat sails around the icebergs, the captain cuts the engines at a suitable place where you can enjoy the panorama. Please note: clients pay for the excursion on board in USD. Excursion boat has mostly outdoor space and limited seats. On this exciting tour you will hop aboard a plane for a low-altitude flight to the very end of the world-famous Ilulissat Ice Fjord, a UNESCO World Heritage Site. You will cruise above the glacier edge, where you can enjoy a breathtaking view of huge icebergs dotted with sky-blue glacial lakes. A window seat is guaranteed for the best photo opportunities. This guided hiking tour takes you to the Inuit ruins at Sermermiut overlooking the famous Ilulissat Ice Fjord. The first people settled in Sermermiut around 2,000 years BC and your guide will tell you more about the culture and lifestyle of the early Inuit, whilst you enjoy the impressive icebergs that pass by on the fjord. The tour includes approximately five miles of moderate hiking on mountain trails. Hiking boots and outdoor clothing are recommended. 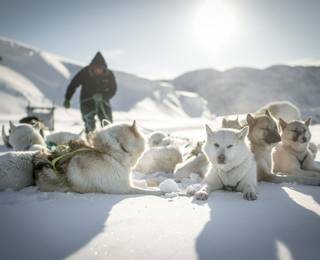 You will visit a local sledge dog owner, who will tell you stories about the relationship between the Inuits and their dogs and how they rely on each other whilst travelling through the arctic landscape. Experience a taste of Greenland during this tasting tour and learn about the way of life here, including the hunting traditions. Whale and seal meat, game, fish and birds are all staples of Greenlandic food. At the small Inuk hostel your guide will introduce you to the local fare which may include a variety of fish, musk ox, seal and other delicacies depending on what has been caught. 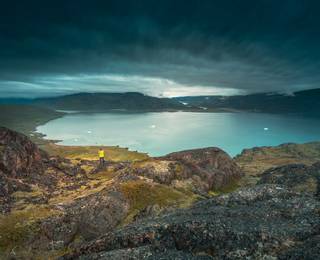 This demanding hike will last around 5 hours (including transfers) but will lead you into the spectacular wilderness around Nuuk. You will need to be reasonably fit and have appropriate hiking footwear and clothes for this 6 mile hike in mountain terrain. 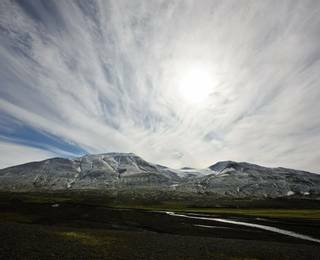 At the foot of the Lille Malene Mountain you will set off with your guide to explore this arctic mountain terrain on foot, hearing fascinating stories and facts about the landscape from your expert as you go. The views on offer are exceptional and you will certainly be rewarded for your efforts. A packed lunch is included. 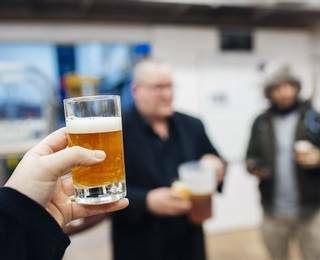 During this excursion, you will visit one of the Greenlandic microbreweries, the Godthaab Bryghus brewery. Sample some of the local beers, which are brewed by using only regional products. 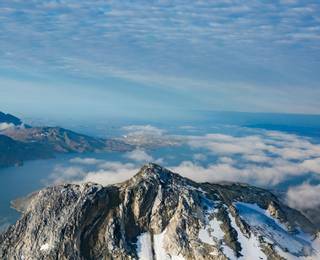 On this 30 minute helicopter flight, you will enjoy the sights of Nuuk and its surroundings from a different perspective. During a ground stop, you will have stunning views of the large fjord system and the capital of Greenland, Nuuk. On this tour you will travel by helicopter to the nearby Eqaluit Glacier. 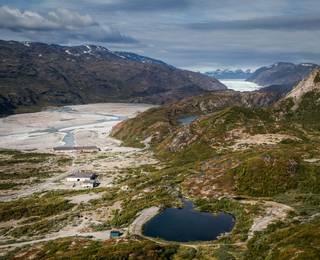 The helicopter flies at low altitude over the coastal mountains before landing in front of the glacier. On this 30-minute stop you will have chance to inspect and photograph the amazing glacier face before the return flight. This guided 8.5 mile hike takes you to a remote former sheep breeding farm in Tasiussaq; you’ll travel along unpaved roads and will need to have good hiking shoes at your disposal. This is a fascinating location but its real charm lies in its views of the Fjord system and the stunning Arctic landscape. On this trip you will hike along the Narsarsuaq fjord for a glimpse of icebergs and glaciers before setting off in a kayak for a paddle across the fjord during which you experience the Arctic landscape from a new perspective. Hiking shoes and outdoor clothing recommended. The small settlement of Qassiarsuk boasts some of the most interesting ruins from the Norse period of Greenland history. Erik the Red settled here after he had been outlawed from Iceland and named the new land 'green land' because the region around Qassiarsuk is characterised by inviting fjord landscapes and green, fertile valleys. On this trip you can see the ruins of the first Christian Church in Greenland and visit the reconstruction of a Viking longhouse. 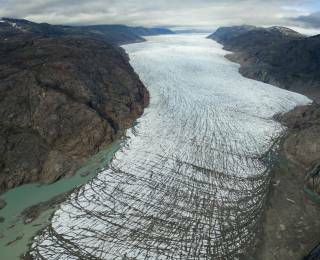 The Greenland icecap produces 250 million tons of icebergs each summer and their last journey begins when they break off into glaciers at the top of fjords. One of these is Qoroq Glacier near Narsarsuaq which can be reached via a 30-minute boat ride. You will board the smaller boats from the ship and cruise into the fjord for a wonderful view of the glacier. Cruising into the fjord, the boats sail a zigzag route through the icebergs and Qoroq in the distance. This is a truly unique experience as you have the chance to play just over four hours of golf in the famous golf course, located beside the sea in a sunken volcanic crater. You can take in the stunning views and the rugged coast while playing 18 holes. The course is ranked as one of the best 200 courses in Europe. Course fee and equipment included golf balls are extra (around USD 5 each). Please note: clients pay for the excursion on board in USD. Handicap 36 is required. 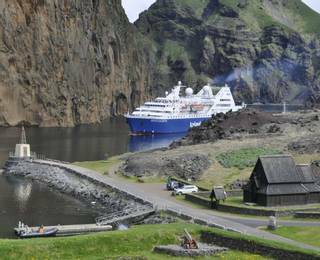 In the Westman Islands, you can enjoy a guided tour of Heimaey by bus. This excursion will highlight the power of nature as you witness the semi-buried homes and the volcanic crater which have been caused by recent eruptions. A museum visit gives an insight into the geology of the island and an account of both the 1973 eruption, which damaged the homes and the 1963 eruption which created the island of Surtsey (entrance to the museum is included). Please note: clients pay for the excursion on board in USD. You will be taken to Heimaey, the ‘Home Island’, which is known for its extraordinary volcanic landscape. In 1627 the Algerian pirates landed on Heimaey and started to plunder and burn down houses, farms and the church. On this two hour hike, you will learn more about the history of the pirate raid that took place in July 1627. Drinking water is required for this hike. Approximately 150 - 220 on board the ship but for activities the group size will be much smaller. A deposit of 20% of the total holiday cost is required at the time of booking. Full payment is required 90 days prior to departure.